A small group of Mahinda Rajapaksa supporters celebrate in Colombo, Sri Lanka. 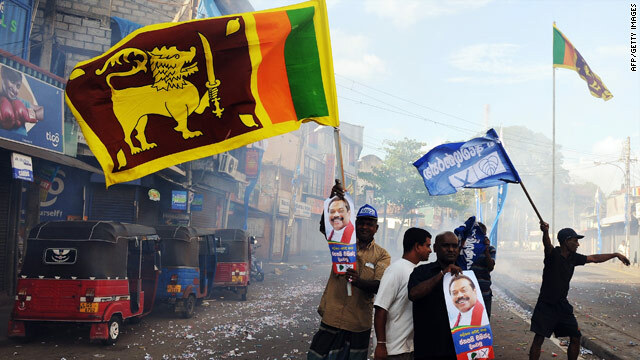 Colombo, Sri Lanka (CNN) -- Sri Lanka has held its first presidential election since government forces put down a 26-year insurgency by Tamil Tiger rebels. CNN's Sara Sidner looks at the election, claims of vote rigging from political rivals who were war-time allies, and what the future may hold for Sri Lanka. What is the significance of the elections? This is the first peacetime election in more than 25 years. Sri Lanka has just emerged from a civil war that has torn the country apart, left tens of thousands displaced, and many argue has stunted the country's growth especially in the north where the war has destroyed much of the infrastructure. Citizens see this election as an opportunity for the government to move the country forward much more rapidly instead of putting its resources into the war. Sri Lanka has long been in the spotlight around the world because of the war that pitted a group called the Liberation Tigers of Tamil Eelam (LTTE), labeled by Washington and the EU a terror organization, against the Sinhalese majority government. The LTTE started its fight for a separate country in the north as a protest against the government for oppressing the minority Tamil population and treating them as second class citizens. Why is this election so hotly disputed? The election pits two powerful men against each other who were just months ago close allies working together to win the war. The incumbent, Mahinda Rajapaksa, is up against his former Army Commander, General Sarath Fonseka. The two men ended up at odds over what appears to be more personal than political. The moment the war was declared over by the two men -- who are largely credited with winning it -- the president put General Fonseka in a government position that held very little power. Fonseka felt as if he had been marginalized and at the same time, once he began trying to work with his Commander in Chief in a peacetime setting, the two men did not see eye to eye on the way to go about moving the country forward. Sri Lanka's election campaign season was violent, according to an election monitoring group in the country. There were more than 700 reported incidents of politically motivated violence several of which ended in deaths as the two candidates made their way around the country stumping for votes. When it came to the actual polling day things cooled way down. Voting was peaceful in the vast majority of the country, except in the north where voters woke up to several explosions hours before the polls opened though no one was injured. The incumbent, President Mahinda Rajapaksa, has won the election with nearly 60 percent of the vote while his main challenger Sarath Fonseka had just over 40 percent, Elections Commissioner Dayananda Dissanayake said. Rajapaksa has claimed victory and will serve a second term while Fonseka says he will not concede the election after accusing the government of fraud. While the vote was being counted the Rajapaksa-led government sent armed troops to the hotel where Fonseka and several opposition leaders stayed for the night. Fonseka and his supporters moved to the hotel due to fears they would not be safe in their own homes after Fonseka said he had received threatening phone calls. For nearly 24 hours troops stood outside the hotel prompting Fonseka to accuse the government of trying to intimidate him and his supporters. Rajapaksa responded that the troops were there for Fonseka's protection and for the protection of the entire hotel since so many political leaders were there -- an explanation Fonseka rejects. Fonseka says he will go to all the legal means to try to nullify the election but said he would leave the country for a while if he felt his safety depended on it. Rajapaksa says he will continue his work as president knowing that voters backed him for a second term. Polls in the Tamil dominated areas showed voters favoring Fonseka. Tamil citizens worry they will continue to be marginalized by the Sinhalese majority government. Tens of thousands of them are still living in displacement camps as victims of the war. The president has said in the past that there are no more minorities in the country, only Sri Lankans and vowed to make the country whole. But in an interview he could not spell out exactly what he would do to help make that a reality for the minority Tamil population.